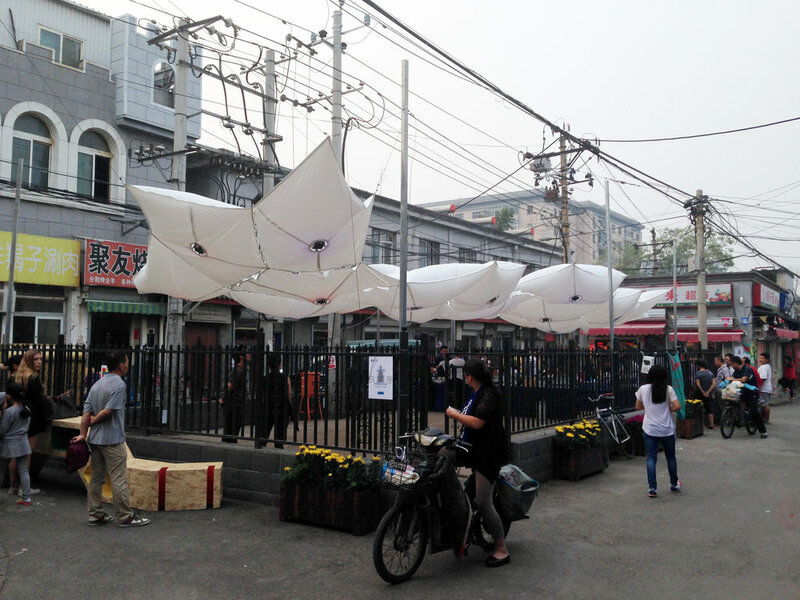 Designed as part the 2016 Beijing Design Week, the Octopus Pavilion served as a key public component for design week activities in the Baitasi neighborhood in the historic center of Beijing. Occupying a plaza in the center of the Baitasi market, this interactive pavilion transformed a trash filled area into a dynamic public space. 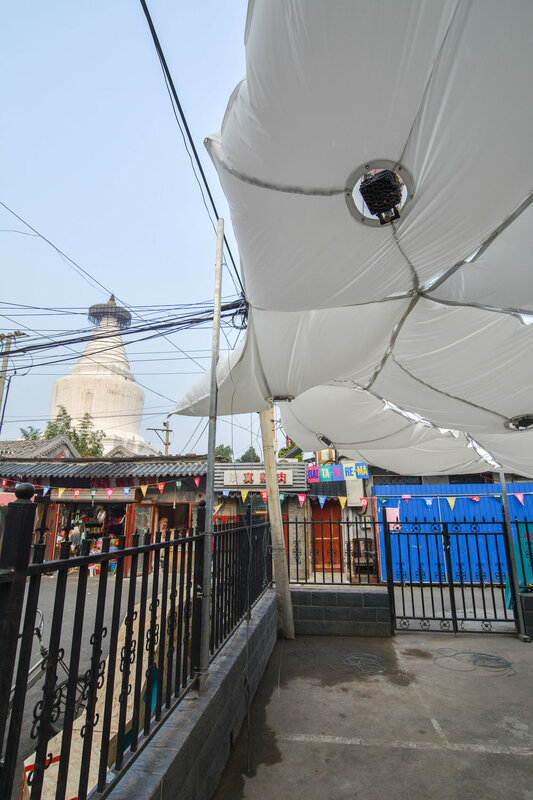 Inspired by the adaptive, highly expressive characteristic of the octopus, this pavilion employed a variety of tactics to achieve flexibility, adaptability, and re-configurability in response to the complex fabric of the historic hutong neighborhood. The pavilion was a part of the Soft City Iniative, which seeks to investigate the use, design, and perception of public space through architectural experimentation, public outreach, and multidisciplinary discussions and publications. This pavilion drew inspiration from the unique characteristics of the octopus. The octopus is soft. Lacking bones other than their beak, they can squeeze through openings far smaller than their body and deform their skin in a multitude of shapes. And yet this softness goes far beyond physical characteristics, to encompass a wide-ranging paradigm of pliant morphology, distributed intelligence, and highly adaptive learning and behavior. Octopuses have the same number of neurons as a cat and yet ⅔ of these are distributed throughout their eight legs. Neurons are clustered in nodes with sensing organs and muscle cells, allowing highly distributed control over sucker articulation, skin coloration and texturing. Octopuses take advantage of this “intelligent skin”, employing it in a wide range of adaptive behaviors, from camouflage, mimicry, misdirection, to mesmerization - tactics of the magician. Translating the characteristics of this intelligent skin to an architectural assembly, the pavilion highlights the potential of soft systems. The pavilion was constructed of 29 identical nylon pneumatic modules, each containing control units with motion and sound sensors, intake and outtake fans, and LED lights. These control units were programmed to react to movement and sound in the public space below. Responding to the activity in the plaza and surrounding market, the pavilion became magnet for activity in the neighborhood. Children in particular quickly grasped the interactive potential of the pavilion and incorporated it into their play, challenging each other to see who could make more pillows light up or inflate. This playfulness brought the plaza to life for people of all ages, while helping to open up a dialogue on the use, ownership, and construction of meaningful public space in Baitasi.